Story: The honorable samurai Shinzaemon (Koji Yakusho) is entrusted with a difficult task. The half-brother of the reigning shogun, Naritsugu (Inagaki Goro), is a cruel man who tortures his people and followers as well as servants in the most gruesome way possible and kills them as he pleases. Naritugi's atrocity is getting around so fast that even the shogun's council of elders doesn't see any other way out but to secretly order his assassination so that the shogun doesn't lose his face. Shinzaemon is the man who is told to assemble a fellowship of samurai in order to intercept Naritsugu on his travel to Edo with their help and kill him. For this he still needs a few skilled men who, among other places, he finds in his nephew Shinrouko (Takayuki Yamada) and eleven other loyal samurai. However, on the battlefield Shinzaemon doesn't only have to hold his ground against an army that completely outnumbers him and his fellowship but he also has to face his arch-enemy Hanbei (Masachika Ichimura), who might not comply with the actions of his master Naritsugu, but being his bodyguard and first of all being a samurai he has pledged his loyalty to him. A bloody battle that is about to decide the future of the country ensues. Review: It is impossible to define Takashi Miike or in any way pinpoint him on a genre. His work that he is best known for outside of Japan, "Audition", was interesting, his movie "Ichi - The Killer" could really impress me, though. The same goes for his extremely controverse "Visitor Q" in which Miike brought the subject of perversion to a new level in a very entertaining fashion. His apparently most respected movie by critics and also commercially most successful one is his recently published "13 Assassins". That a director who makes two to four movies a year can create a work of such outstanding visual expertise is astonishing. The budget of 20 Million dollar has been pretty high for a Japanese production and Takashi Miike proves that he knows how to invest so much money profitably. "13 Assassins" is a well-achieved old-school samurai film that reminds us of Akira Kurosawa. But the many critics' paeans of praise are without reason: Takashi Miike's newest movie is no masterpiece! Being Japan's official addition to the International Film Festival Venice and a good samurai film many critics apparently thought that this would make it a milestone in film history. If you look around a bit on the internet you will find positive review after positive review. This almost gives the impression that these so-called critics actually don't have a clue at all and seemingly felt forced to find so many positive words because some well respected critic started heaping praises on the movie. Obviously, those critics don't know much about Asian cinema because even I, who doesn't regard himself as an expert when it comes to Japanese samurai-movies, have already seen most of what's shown in this movie before! That's no surprise at all since Miike's work is even a remake of a movie from 1963 with the same title, that at that time was brought to screen by Eiichi Kudo. 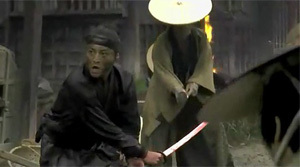 Apart from that even Ryuhei Kitamura paid homage to those samurai flicks with his "Azumi", which might have been a bit more over-the-top, but for that matter also was a lot more entertaining and no critic can tell me otherwise! The movie's problems lie in the fact that the director has nearly no space to illuminate the characters. As there are 13 assassins this is already difficult to begin with but Takashi Miike is actually going the right direction and focuses only on a handful of them. But even they don't get the time they would need to become more three-dimensional or create an emotional bond towards the viewer. This is most apparent during those scenes in which of course some of them don't get to survive the big showdown. The drama that could have found its way into the movie here is simply missing and so the viewer isn't touched at all by the fate of some of the protagonists. Outside of Japan the movie has only been published as an International Version which is cut by 20 minutes. However, the scenes that have been cut out are by far no especially bloody scenes because even though it is "only" Rated R there are heads rolling and blood is splattering in fountains. Instead some scenes have been cut out which assumedly concentrated a bit more on the characters, scenes which eventually would have slowed down the pacing. So maybe the Japanese Director's Cut version of the film can bring some more drama into the film, because that's just what's missing in the International Cut. Koji Yakusho ("Shall we Dance", "Pulse") can't make up for that either, although he is again delivering a great performance and also knows how to handle a sword impressively. A few of the individuals have certain character traits, but it's simply not enough to make us care for and suffer along with them. The first half of the movie is full of dialogues and plans constantly being schemed. But even then it becomes obvious that a high budget was at disposal which can be seen in the beautiful sets and the well done directing. The 45-minute long showdown at the end is in fact a nice action fest, but even here it has to be pointed out that the fights aren't really breathtaking. Everything is rather simple and realistic in tone despite a few impressive explosions, and the finale strongly reminds us of the aforementioned "Azumi", which was a whole lot more entertaining and actionloaden in this respect, though. Takashi Miike is a master of shocking cinema but in this movie he is allowed to prove this in one scene only, in which the fate of a woman whose hands and feet have been cut off by Naritsugu is shown. 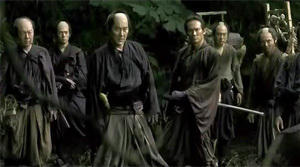 Apart from that there is only a savage standing out from the rest of the film, who the samurai run into during their trip through a forest and who becomes the last one of the group. Apparently, he is some sort of forest spirit/god. Other than that "13 Assassins" is actually a rather commercial samurai film which carries not much of Miike's handwriting, although it has to be admitted that it is pretty difficult to say how this handwriting is supposed to look like with a director that is at home in any genre. Those who lower their high expectations stirred up by so-called "respected critics" will undoubtfully have a fun ride with "13 Assassins". Nice directing, good action with old-school samurai style wrapped in a modern cinematic exterior guarantees good entertainment, which only lacks the necessary drama a bit.